Push Alerts for iPhone App Updates – Good Idea? A few days back the PhatNotes app generated a push notification to let me know there was a new update for it available in the App Store. I don ‘t recall seeing a push alert for a new update from any other apps before. 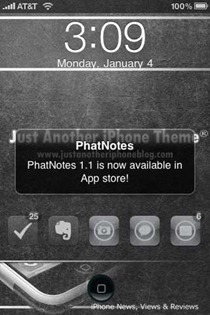 As much as I tend not to be a big fan of push alerts, I have to admit I liked seeing this alert for the PhatNotes update. Though I don ‘t think I ‘d ever want *every* app sending me alerts (at least not while I ‘m running around 150 apps and upwards), I do think that allowing selected apps to send them would be quite handy. I ‘d like to get update alerts from some of my most used / critical apps “ and also probably from some apps where I know they currently have a bug that is promised to be fixed in the next update. What about you guys (and gals)? Is this an alert type you ‘d like to see used by more apps? The App Store already has a function that adds a little red circle with the number of updates available (just like phone messages, email, etc.) For many people that might be enough. Constant pop-up alerts can be annoying and people should always have a way to opt-out of them if they want, IMO. Agree on both points – and it should of course allow for selection / de-selection of apps that will send these alerts. I don’t think so, but I’m probably more sensitive to push notifications than others might be. Maybe badge notification, where you get a red 1 or something similar by the app icon. Also, not sure it’s necessary. From personal experience, I launched my App, Appswell in middle of October, and we did our first update about 2 months later, and I saw about 80% of our audience update within one week.